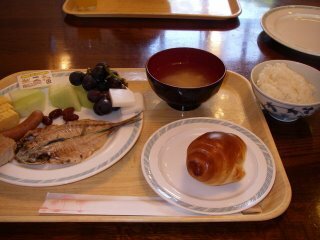 I eat bread and rice, if a morning breakfast is a buffe in Japanese hotels. I want to eat varius food in a hotel. Because, usually I eat simple breakfast. So, I don’t have time to cook and eat in the morning. I have to go my office hurruedly(in a hurry). Do you have your breakfast at a hotel? Is it regular? I don't understand. Oh, no. It is not regular. When we went skiing, we sometimes stayed Japanese style hotel. And we eat breakfasts. In fact, My sons like McDonald. One more thing, this hotel fee is not expensive. Four people fee is almost one people. Company's pay for my family. Therefore employees want to stay thesas hotels. It is difficult to reserve in busy seasons. Hotels are extremely expensive here, that's why I asked. And do you allow them to eat what MacDonald has to offer? My sons like MacDonald hamburgers and fewnch freies. They want to go MacDonald shops. But I think Japanese food is more healthy than hamburgers.